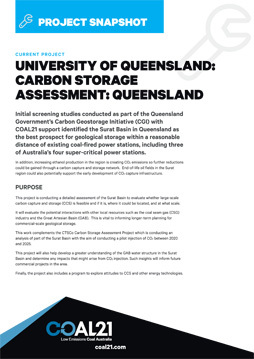 Initial screening studies conducted as part of the Queensland Government’s Carbon Geostorage Initiative (CGI) with COAL21 support identified the Surat Basin in Queensland as the best prospect for geological storage within a reasonable distance of existing coal-fired power stations, including three of Australia’s four supercritical power stations. In addition, increasing ethanol production in the region is creating CO2 emissions so further reductions could be gained through a carbon capture and storage network. End-of-life oil fields in the Surat region could also potentially support the early development of CO2 capture infrastructure. 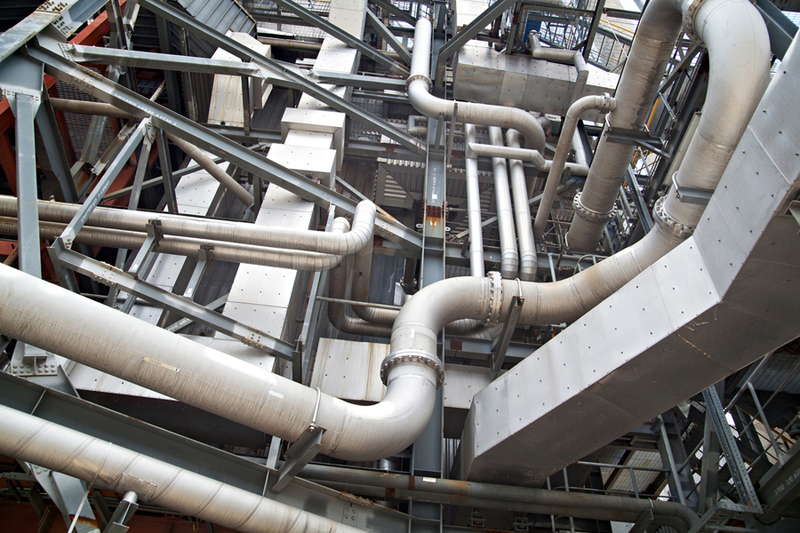 This project is conducting a detailed assessment of the Surat Basin to evaluate whether large-scale carbon capture and storage (CCS) is feasible and if it is, where it could be located, and at what scale. It will evaluate the potential interactions with other local resources such as the coal seam gas (CSG) industry and the Great Artesian Basin (GAB). This is vital to informing longer-term planning for commercial-scale geological storage. This work complements the CTSCo Carbon Storage Assessment Project which is conducting an analysis of part of the Surat Basin with the aim of conducting a pilot injection of CO2 between 2020 and 2025. This project will also help develop a greater understanding of the GAB water structure in the Surat Basin and determine any impacts that might arise from CO2 injection. Such insights will inform future commercial projects in the area. Finally, the project also includes a program to explore attitudes to CCS and other energy technologies. The project is collecting geological data from various coal seam gas, conventional oil and gas and groundwater-related operations in the region and other mining activities. The team will use this data to investigate the geological characteristics of several areas of the basin to evaluate their potential and identify the most likely large-scale location. The Carbon Geostorage Initiative Project started in 2009 and ended in 2013. From 2016, the work continued as the University of Queensland Surat Deep Aquifer Appraisal Project, more commonly known as the Queensland Storage Assessment Project. This project is due to finish in 2019. The project has used pre-existing data from a range of sources, including oil and gas exploration and flow testing from water bores, to analyse several geologically distinct regions within the Surat Basin. The team is continuing to collect data from large-scale water injection from the CSG sector as well as sourcing new data via other oil and gas operators, including from the Moonie oil field. From this data, the team will develop a regional model showing where to focus future CO2 storage activities and enable further GAB studies to understand the interactions of the various water tables and the potential to use CO2 to re-pressurise the water tables, making more water available for farmers to use.